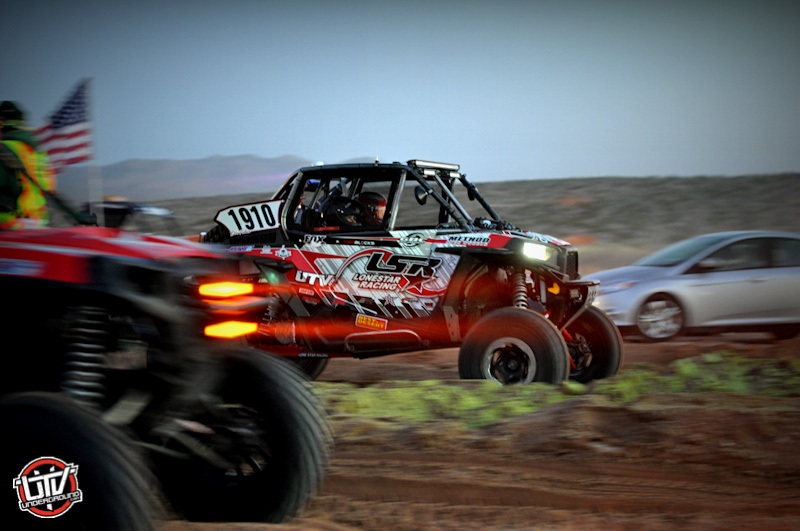 The 2014 Mint 400 is the closest thing to the “Super Bowl” that off-road racing has. 350 competitors, 50 (+/-) of them being UTV racers would make up the field of competitors. 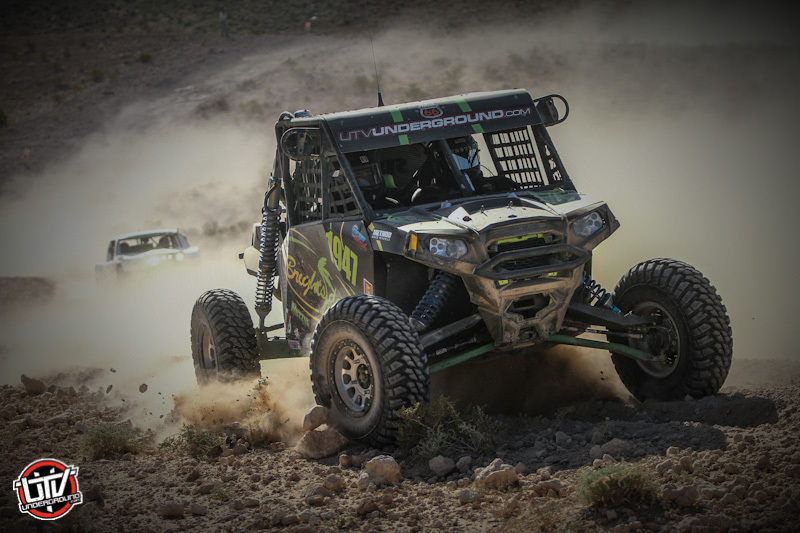 UTVs have been around a while, car counts keep growing, but this years Mint 400 really put a stamp on the sport and solidified that UTVs are here to stay. UTVs really only run the Mint 200, as they only get 2 laps vs. the 4 laps the unlimited guys get to run in the afternoon. Its a time crunch which prohibits the UTVs from getting in a full 4 laps, a crunch we hope to change in the future, but if you talk to the 25 UTVs that actually made it across the line I think they would tell you that 200 miles is good enough for them! Of the 50 starters, only 26 would finish. That is the same attrition rate that the trophy trucks would also have in the big race this year, 50%! Those who have raced the Mint know that this course deteriorates quickly and with each mile it begins to really take its toll on ones machine. Bent wheels, flat tires, blown shocks, roll overs, smashed a-arms, blown engines, failed drivelines, and much more were all part of this years race. No one came away unscathed! Much is to be said about this fantastic race. Its more than just a brutal off-road competition, it is a spectacle. It is historic in many ways and if you race off-road yet don’t attend The Mint, you can’t help but feel like you’re missing out on something. 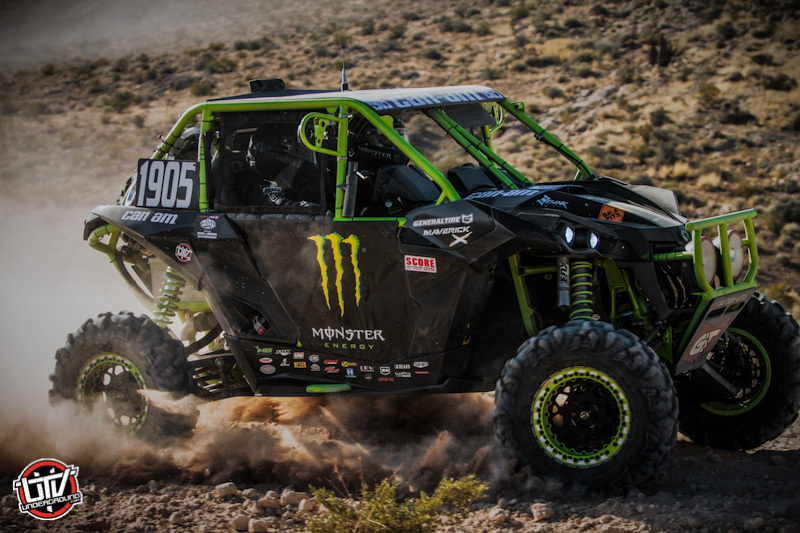 The who’s who attend and compete at The Mint 400. You realize at contingency on Thursday that this isn’t no ordinary event. 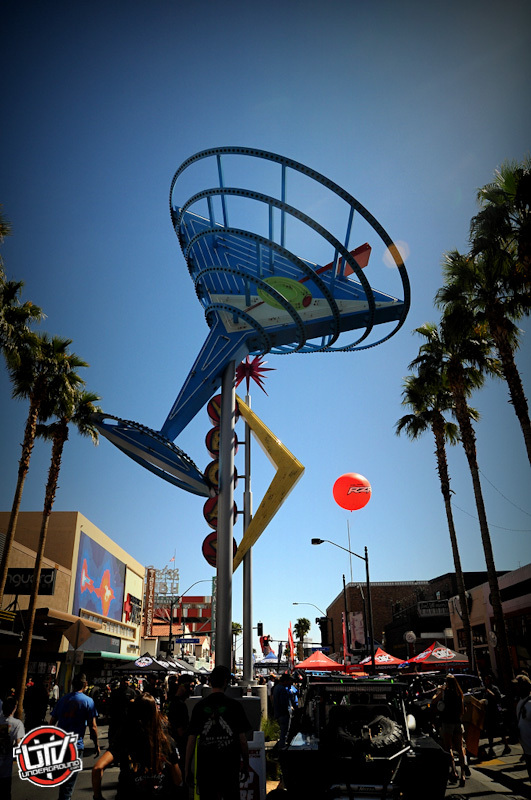 10′s of thousands of fans, teams, sponsors, and just general Las Vegas tourists fill Fremont St. to watch the racers push their cars through to tech. The atmosphere is festive, the drinks are flowing and everyone seems to be enjoying themselves. But as the sun starts to settle over the Las Vegas skyline, you can’t help but feel the mood shift. Teams have all but disappeared loading their remaining vehicles back onto trailers while drivers and co-drivers make their way to the mandatory drivers meeting. Eyes begin to sharpen, laughter turns to focus, and with one final “Booyaa” from Casey Folks, everyone here for the Great American Off-Road Race are immediately transformed from attendees to competitors. Its time to go to work…. Racers funnel their way into “main pit” in Jean, NV starting for some as early as 3am. By 5am the normally quiet Nevada Desert is gleaming with the flashing blue and amber lights from a gigantic field of racers. Engines idle, dust is stirred, camera flashes pop, and red start lights turn to green. Casey Folks, director of the sanctioning Best In The Desert series, sends racers off into the dark 2 at a time, side by side, in :30 second intervals. Organization is key, and usually at this point everything is on point, however this race was chaos. Staging volunteers quickly succumb to confusion. Casey is sending racers off, all while staging officials are lining up racers incorrectly. Not all were in the wrong order, but many were. Late start VORE racers in large trucks were being sent off in the middle of the UTV pack, UTV racers who were supposed to be sent off deep in the pack were being placed next to those closer to the front. One racer didn’t even make it to the line before he fell victim to a mechanical while another SR1 racer made it about 50ft. before he broke smack dab in the middle of the inside start lane. The Mint 400 was on, and it was going to be interesting right from the start. While we had photographers and video guys all over the race course and in the air, as is the case in most off-road races, the remote landscape wreaks havoc on communications. Its hard to track the race and get everyone’s story. So much happens in these 2 laps, so we prefer to try and let the racer share their own stories in our forums or on their pages. We love to tell everyone’s story but when you have 50 racers competing in only a 2 lap race it gets pretty difficult so we apologize for not having info during and after the race that we know many of you would love to see, read and know. 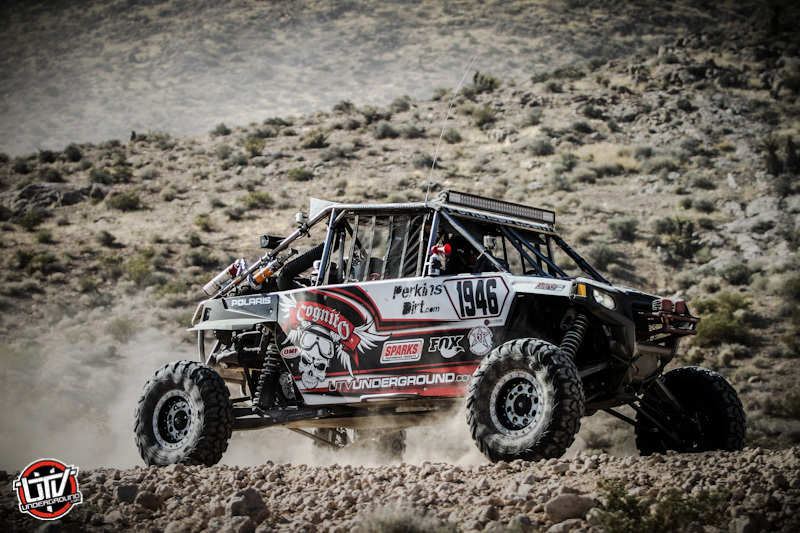 Brandon Schueler in the 1919 Jagged X / Polaris RZR would WIN the 2014 Mint 400. This would be his first win at The Mint, and would be his 4th Pro UTV win in a ROW competing at BITD. I think some of you can see why he hasn’t made the jump into his new Polaris RZR 1000 just yet, why change when your current 900 is dominating? Schueler is on a terror, back in his groove that has won him more UTV championships then anyone else competing in UTV desert racing. Its impossible to discredit not only his driving abilities but also the Jagged X team. Every race they come to win, and not only do they get their fair share of wins and podiums, they always do it with class. Congrats Brandon, you deserve all that you get in return and you certainly put in one hell of an effort! Despite having troubles getting their IRC trackers the day before the race, to getting them installed that night, to not having it work throughout the race leaving their team with no idea where on course they were, to suffering a severe flat tire mid race, and on and on and on… Schueler still came out and laid down a winning performance. Marc Burnett in the 1905 Monster Energy / Can-Am Maverick laid down his best BITD UTV race yet. 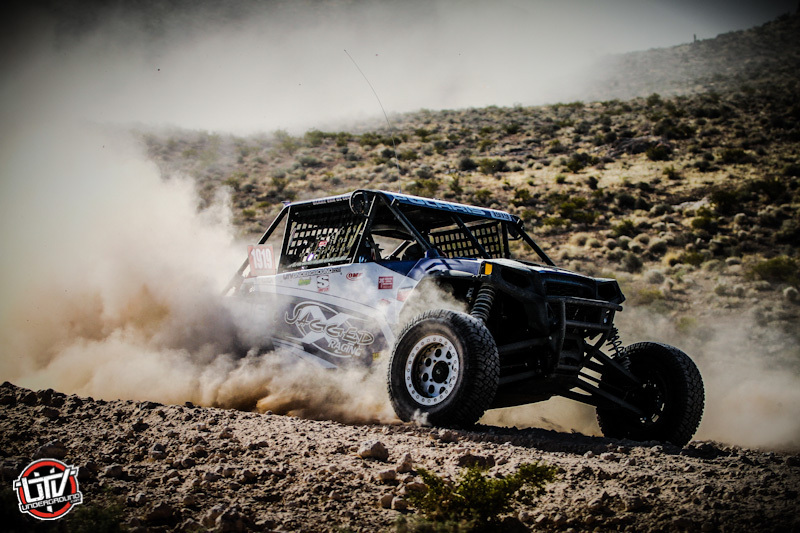 Burnett’s rookie (UTV) season in 2013 proved to this off-road veteran that UTVs are a different animal but 2014 so far has been really good to Burnett and his Can-Am team having won the first race of the 2014 SCORE season in San Felipe. Burnett was fast and aggressive at The Mint 400. But his aggression left him with a flat tire and broken rim which took him more time then he could afford to lose to repair. 2nd place is not anything to be bummed about, especially at The Mint 400. In the short UTV history at the Mint (3 years) Can-Am has done well and this year we saw more Can-Ams competing then we ever have. Congrats to Marc and his team for their awesome performance This teams involvement really shakes things up and we look forward to watching them battle all year long. 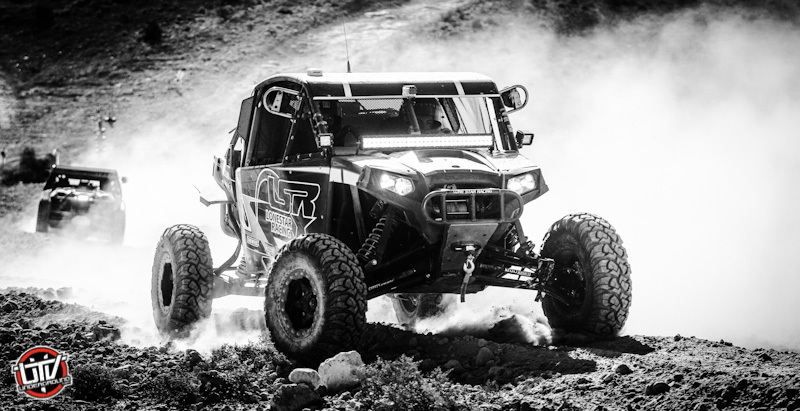 LoneStar Racing rolled in DEEP to sin city and The 2014 Mint 400. Showing up with like 7 or 8 UTVs, most of which were brand new. But one was not, it was already proven, but not at BITD and not at SCORE. No, this machine was fresh off enjoying a King Of The Hammers podium finish before it made its way to Las Vegas. Branden Sims and his 1913 Polaris RZR is fast! He charged quickly into the lead and at one point was looking to us tracking at the start finish line like he may actually check out. We don’t know what slowed Branden down but at the end of the race he would be sitting in the 3rd place podium position enjoying the spoils of all his teams hard work in their first ever BITD competition. Sims and the entire LSR / Polaris team are looking to really shake things up. Congrats Branden, we look forward to seeing you and your entire crew at many more races, that is if your car can make it?? I mean, you just punished it back to back at the 2 roughest UTV races in the world! hahahh Nice work Sims. 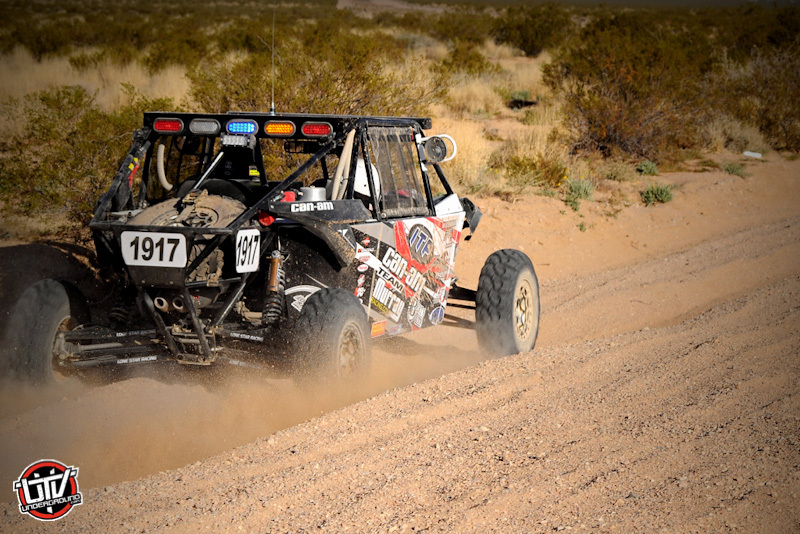 The Murray Motorsports / Can-Am team won the 2012 Mint 400, the first year UTVs were allowed to race. This year would be slightly different as brother Jason Murray was still be recovering from a severe injury to his hand suffered in February’s King Of The Hammers race. Despite battling without Jason in the car, Derek and the entire team did what they do so well and thats put their heads down and go compete. Their determination would land them in the 4th physical position but 5th on corrected time keeping Can-Am in the mix and proving once again that the Maverick is not to be overlooked in competition. Many people were wondering why was Matt Parks driving in place of Craig Scanlon in the 1931 jagged X / Polaris RZR? Craig was so pumped to be at this race, for weeks we would talk about The Mint 400, his new RZR, his testing and preparation. He could not wait for this round! A few weeks ago Craig was snowmobiling and ejected himself. He hit his head pretty good, enough to give himself a concussion. He didn’t think much of it and as the weeks passed he began to have some after affects of the accident. While he is in good condition and will certainly be back, it was just too close to force the situation and get back into a competition where he could potentially hurt himself further. Scanlon made a tough decision to not race giving Matt Parks the nod to drive for him. In the end the decision would land the 1931 Jagged X / Polaris RZR in the 4thth position overall by just under :30 seconds from the 5th position Can-Am. It was good to see Parks back in the mix at BITD, but we look forward to Scanlon’s return as well. Get healthy Craig, we missed you out there! Its been a while since we have seen a highly competitive Kawasaki Teryx in the mix at a BITD race. The Parker Oil Teryx comes out to a few races every year, competing in sportsman usually and they always seem to do well. But their machine has been around a while and was built when many were still racing the Teryx in the desert. With the influx of higher powered, bigger suspended UTVs, the Kawasaki along with the Yamaha Rhino have pretty much all been forced into retirement. That is until Scott Martinez, driver of the 1951 John Deere RSX asked Casey to create an 850 class for the smaller engine UTVs to compete in. In the second race for this new class we got to see not 1, but 2 Kawasaki’s reach the podium with first place going to David Lyttle in his brand new 2014 Kawasaki Teryx-4. This machine not only looks like one of the coolest UTVs out there, it worked as good as it looked. Despite running with an all stock drivetrain, Lyttle took the top spot giving Kawasaki their first win in some time at BITD. Scott Martinez in the 1951 Monster Seal / John Deere would take 2nd and Renee Hudson would claim 3rd in her 1959 Parker Oil / Kawasaki Teryx. It was awesome to see this class swept by 2 different OEM’s, extra props to John Deere and Kawasaki! Again, so many stories, too many to tell and we apologize for not being able to give each and everyone of you your due love and respect. You all deserve it, and I long for the day when UTVUG can have multiple reporters spread across the race course to capture all of the moments that truly make up these fantastic races. In the end we can’t thank you all enough for your support and gratitude towards what we do. You including us on your cars, in your race reports, and seeing UTVUG listed as sponsors on your BITD forms, man it really makes us proud! We take notice, even if we don’t say it, we do see it and we do appreciate it! So thank you for all of your return support. UTVUnderground.com wants to also take a minute to thank our awesome staff who contributed tremendously to this years event for us. First and foremost my boy Rusty Baptist. He truly is my right hand man, always there to help support the cause and he cares as much about this whole thing as I do. Mad Media as a staff and as the promotors / owners of The Mint 400. Mad Media has been the catalyst to taking UTVUnderground to where it has gone these past couple of years in terms of our level of content. Back out what they do for us in the video and photography world, as promotors of The Mint 400 I think its fair to say that they have injected a ton of adrenaline into this sport. The Mint 400 went off this year and thats because of the hard work that Matt and Josh Martelli as well as their entire staff put in. Of course I want to thank our contributing photographers, Rusty, Vincent Knakal, Ernesto Araiza, Jason Zindroski and Shilynn Milligan. While I worked with an iPhone to bring quick social updates all race long, these pro’s were out in the dirt doing what they do to bring us all these amazing images! We will launch an extended gallery in a day or so with even MORE high quality images, many of which were taken by Vinny from the Helicopter, so if you don’t see yourself in this huge batch below, hopefully we got one of you coming in our extended gallery. Speaking of helicopters, we need to give huge props to Peter at BlueTorch Fab for offering to us, UTVUnderground.com, to have our very own dedicated chopper. While Mad Media flew around in a few of their own camera rigged birds, UTVUG had our own bird to take photos from in the morning race. I even got to go up in the afternoon to chase trophy trucks, that experience was insane! Lastly I want to thank all of our wives who not only come with us to these races but to also help. Many of you were handed your driver bags by our wives. They work tirelessly to organize all of those goodies as well as sell all of our merch at contingency. Thank these ladies when you see them, they are all doing it as volunteers! Well thats it, The 2014 Mint 400 is in the bag. It was by far the best Mint I have ever been too and been a part of. Thanks again to all who attended and sponsored this race event. Polaris RZR, Pro Armor, Can-Am, and all of the rest of you who stepped up to make sure UTVs were well represented during this event, THANK YOU!